Miles Amos ’19 attempts a free throw late in the game. The Knights lost, but have earned a berth in the CIF State Championship. 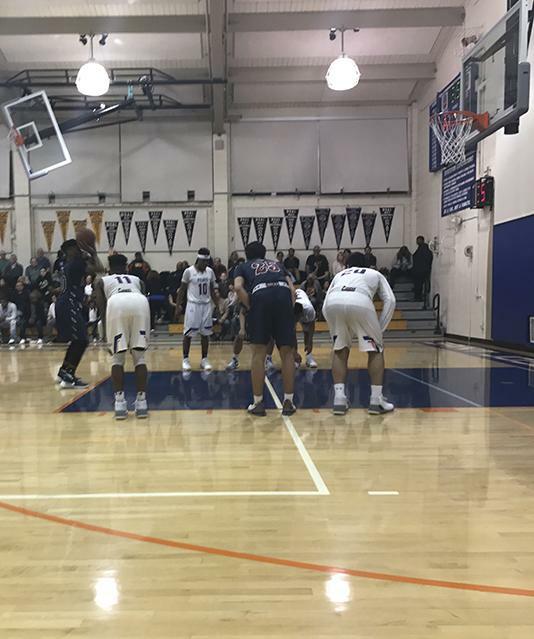 The Knights were eliminated from the North Coast Section tournament with their 64-40 semifinal loss to St. Joseph Notre Dame tonight. Stuart Hall won the tip, starting the game with a layup by point guard Miles Amos ’19. Following the quick basket, St. Joe’s employed a high pressure 2-2-1 full-court press, falling back into a 2-3 zone in the half court. The defensive strategy caused the Hall to turn the ball over at a high rate, something the coaching staff said that they were looking to avoid. Jade’ Smith ’17 opened up the Pilots’ motion offense with a dunk, three minutes into the first period. Fouls plagued both teams, especially star players, Smith and Sean Ingoglia ’18, who were forced to the bench early. Guard Jeremiah Sullivan’s ’17 tenacity was on display during the early stages of the game, with a steal and buzzer-beating finish as the Hall went to the locker room down five, 27-22. The Pilots’ opened the second half with a ferocious offensive attack, leading to a flustered and rattled Stuart Hall team. The Hall was reluctant to shoot the three, only attempting five in the contest. Near the end of the third quarter, Jade’ Smith went down with an injury on the court, saw the trainer, and walked off under his own power. He returned to the game with 1:06 left in the quarter. The fourth quarter began with emotions flaring for both teams, as four technicals were called. Officials broke up a scuffle between Amos ’19 and Smith ’17. Smith tallied two of the technicals himself, resulting in his ejection with 6:30 left in the fourth. Ingoglia also racked up a technical, eventually fouling out with 5:40 left in the game. Cameron Ba ’18 and Darné Duckett ’17 took over the game from Smith, for the Pilots. The duo hit clutch threes and made hard-nosed defensive plays. The Knights waved the white flag with three minutes remaining in the fourth as they subbed in the deep bench, making the Pilots’ win all but certain. Although eliminated from NCS, the Knights have qualified for the state tournament and will begin play in that competition next week.